Derry-based film maker Tom Collins’ star-studded, Irish language feature film, ‘Aithrí/Penance’ is to have its television premiere on TG4 this Easter. 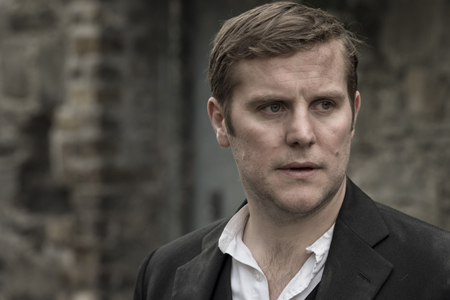 Shot in Derry & Donegal and inspired by a short story from Pádraic Ó Conaire, ‘Aithrí/Penance’ tells the story of priest EOIN O’DONNELL, played by ‘Love/Hate’ star Peter Coonan, who recruits impressionable teenager ANTAINE to fight the British in 1916. Fifty years later violence travels full circle when seasoned gunman Antaine returns seeking vengeance. Produced by Derry based DeFacto Films and Edwina Forkin’s, Zanzibar Films, ‘Aithrí/Penance’, is produced and directed by Collins and co-written with Greg Ó Braonáin. Collins’ previous credits include ‘Kings’, ‘An Bronntannas’ and ‘An Béal Bocht’. ‘The screening of the film on TG4 offers the audience a chance to engage with a story about characters in an extraordinary situation, as they deal with the historic roots of today’s partition’. Pól Brennan of ‘Clannad’ fame composed and arranged the atmospheric soundtrack. The renowned cinematographer Ciarán Tanham was Director of Photography and ‘Aithrí’ was edited by Dermot Diskin. Shot in Derry and Donegal the film is supported by TG4, BAI, Fís Éireann (Irish Film Board), the Irish Language Broadcast Fund, Northern Ireland Screen and Section 481. ‘Aithrí/Penance’ can be seen on TG4 this Easter Saturday, 20th April, at 8.55pm on TG4. Tá ‘Aithrí’, fadscannán Gaeilge de chuid Tom Collins atá lonnaithe i nDoire, le taispeáint den chéad uair ar an teilifís ar TG4 faoi Cháisc. Arna léiriú ag DeFacto Films i nDoire agus Zanzibar Films le Edwina Forkin, scannán é ‘Aithrí’, arna léiriú agus arna stiúradh ag Collins agus a chomhscríobh Greg Ó Braonáin. I measc saothar eile Collins bhí ‘Kings’, ‘An Bronntanas’ agus ‘An Béal Bocht’. ‘Tabharfaidh an taispeántas ar TG4 deis don lucht féachana scannán a fheiceáil faoi charachtair atá i gcás ar leith, iad ag iarraidh dul i ngleic le fréamhacha na staire arb iad is cúis le deighilt an lae inniu’. Is é Pól Brennan ó ‘Clannad’ a chum agus a chóirigh an ceol don scannán. Is é an cineamatagrafaí aitheanta Ciarán Tanham an Stiúrthóir Fótagrafaíochta agus is é Dermot Diskin a bhí i mbun eagarthóireachta ar ‘Aithrí’. “Is iontach an rud é mórscannán Tom Collins ‘Aithrí’ a fheiceáil ar an scáileán. Táimid faoi chomaoin ag muintir Dhún na nGall agus Dhoire, na contaetha ina bhfuil an scannán bunaithe, a d’oibrigh linn chun an scéal seo a thabhairt chuig an scáileán. Gabhaimid buíochas leis an dream a chuir maoiniú ar fáil, leis an gcliar agus leis an gcriú as a gcúnamh agus chomh dílis is a bhí siad. I nDoire agus i nDún na nGall a rinneadh scannánú ar an scannán a fuair cúnamh ó TG4, BAI, Fís Éireann (Bord Scannán na hÉireann), An Ciste Craoltóireachta Gaeilge, Scáileán Thuaisceart Éireann agus Alt 481. “Tá ríméad ar TG4 an scannán ‘Aithrí’ a thaispeáint den chéad uair ar an teilifís faoi Cháisc. Ba togra uaillmhianach a bhí ann a raibh cliar agus criú den chéad scoth ag obair air. Glactar inspioráid ó stair chasta na hÉireann agus cuirtear casadh nua-aimseartha ann – bhí sin riamh ag baint le ‘Súil Eile’ TG4, léargas eile a thabhairt ar shaol na hÉireann agus déantar sin go paiteanta sa scannán fíorspéisiúil seo”. “I ndiaidh an scannán a thaispeáint ag féilte scannán i Londain, Chicago agus Gaillimh tá ríméad orm go mbeidh deis anois ag lucht féachana TG4 sult a bhaint as ‘Aithrí’, scéinséir uaillmhianach a bhfuil cliar den chéad scoth ann. Bíonn a chuid dúshlán féin ag baint le drámaíocht Ghaeilge a léiriú agus bíonn sin níos mó fós nuair a bhíonn roinnt suíomhanna agus tréimhsí ama i gceist mar a bhí sa tionscadal seo. Bhí ríméad ar Scáileán Thuaisceart Éireann agus an ILBF tacú le forbairt agus léiriú an scannáin seo in éineacht lenár bpáirtithe. Beidh ‘Aithrí’ le feiceáil ar TG4 Satharn Cásca, an 20 Aibreán, ag 8.55pm.